This summer I have just been loving the tomatoes. I don't know what in the heck it is, but I just can't get enough of them. 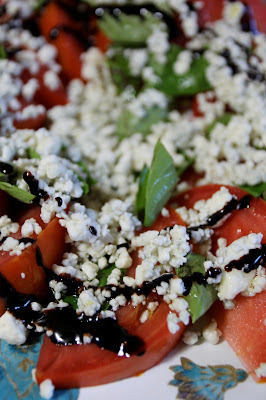 Now, normally, I really like a tomato caprese salad with the mozzarella and the basil and the tomato all stacked high and looking purdy. BUT, this year, I had another idea: let's swap that mozz out for some bleu cheese and see how it tastes. Holy tomatoes it's my new favorite!!! I have been eating the ever-loving bajeezus out of this salad. So of course I had to share it with you all because I know you will just love it as much as I do. It'll probably be your new favorite before too long. Also? It's as simple as it is delicious. And that's a win-win situation! So, get yer 'maters ready--it's time to eat! One tomato, and ten leaves of basil. Guess what? We aren't even going to worry about slicing up that basil. We are gonna year it with our hands. Yep. That's right. But first things first: slicing up that tomato. As you can see I cut it into wedges. They aren't super thick, but they aren't thin either. They are medium wedges. You can wedge it any way you like. But wedges, for presentation purposes, are the best. 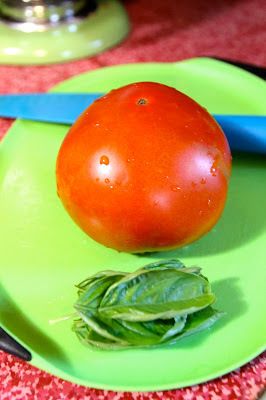 Now, tear your basil on top of your tomatoes. See how easy that was? And now your hands smell good, too. You're welcome! I also like to salt and pepper my tomato at this point. You with me? Now, on how much bleu cheese to add, this is a preference thing. I feel like I always say this, "It's a preference thing" but you know what, sometimes you gotta calls it like you sees it. And that is how I sees it. I take a big old bunch of bleu and bleu it up. You might like a little less cheese. You might even want more cheese. Cheese like you likes it!!!! 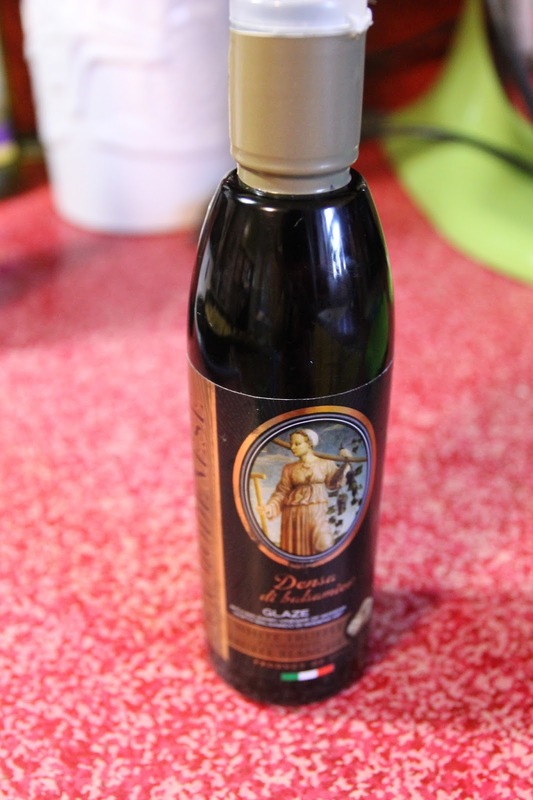 Now you are going to drizzle with olive oil and balsamic glaze. I love the balsamic glaze on this because it's just delightful as heck and really sticks to this dish properly. If you haven't got balsamic reduction or glaze hanging around in your cabinet, that's okay, you can use balsamic vinegar too. But seriously do yourself a favor and get the glaze. It's divine. This is what my bottle of glaze looks like. It has truffle oil in it too, just to give it an extra POWY! It was a Christmas gift. I have been hoarding it. Here is another glorious look at this wonderful dish! I serve it as a side dish, OR when I am alone, I make this and just plain eat it. Why? Because I can!!! Another tip: this is great over arugula OR with cucumbers added in! "some" bleu cheese, crumbled because "it's a preference thing"
Slice tomato into wedges and lay them in a circle on a pretty plate. Tear the basil leaves in half with your hands because when it comes to chopping this basil, "Ain't nobody got time for that!" Add your bleu cheese crumbles over the whole thing. Like a lot of bleu cheese? Add a bunch! Not so much? Add a little less. This, as I have said before, is a preference thing. Drizzle your extra virgin olive oil over the whole thing by going once around. Hit it with some balsamic reduction. Rejoice at this awesome salad. Do a little happy dance. Eat.